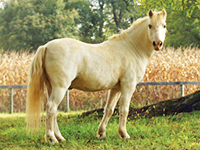 Logan is a white paint pony with stunning blue eyes who we took in in July 2011 from a riding stable because his behavior was dangerous to children riders. Logan had been to the auction twice before, and had Mylestone not saved him, he would most likely have gone back a third time. Although said to be 8 or 9, he was actually in his late teens at the time. We immediately discovered that Logan was indeed very head shy, as if always waiting to be hit or beaten about the head. From his behavior it appeared that he may have been experiencing pain in his neck, and also, from how he held his head, that he may have been used as a driving horse and once in a tight head set. 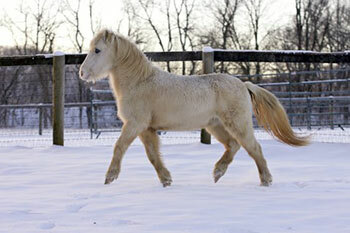 Logan is not a dangerous pony, as much as one in pain when he was ridden, as verified by our veterinarian. He has severe arthritis in his neck. Due to past abuse, he is fearful of being touched, brushed, or of much contact at all. We are working with him slowly, to entice him to begin to trust. He has come a long way. He is actually quite sweet. He has his own paddock where he spends his afternoons and evenings, but enjoys coming into the barn during the day. Beginning in March 2018, Logan has developed some medical issues which have reoccurred several times, and may now be chronic; it's not determined for sure. He goes off his feed and becomes sick; bloodwork shows that he is losing protein in his gut, and symptoms are similar to those of someone with Crohn's disease or cancer. The cause is unclear. At these times, Logan is only interested in grass, so he is grazed often during the day to keep him eating and is administered fluids and given antibiotics and steroids. We worried if he would pull through the last time this occurred, but when he began eating his grain again, then hay, we knew he was on the mend. He will be closely monitored for any future signs of reoccurrence. 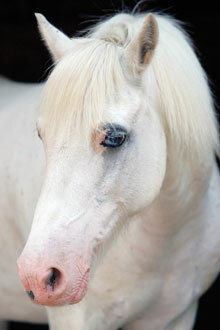 Logan will stay with us as a sanctuary horse. 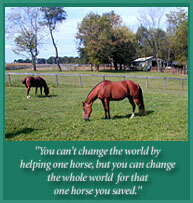 We hope you will consider making a donation towards Logan's ongoing medical care or by being his sponsor. He has made so much progress in so many ways – he is now friendlier and more willing to come over and say hello. He would be very grateful, just knowing you care. Logan was next to Shadow when he first arrived and they became good buddies. 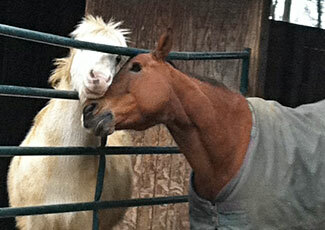 Read more about Logan's rescue.